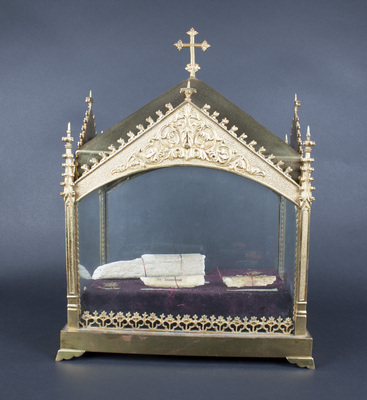 "Reliquary casket containing a piece of cloth soaked in the blood of Sa"
Reliquary casket containing a piece of cloth soaked in the blood of Saint Philip Neri, and relics of Saint Julia of Corsica, the Holy Innocents, Saint Anthony of Padua, and an unidentified saint. The document certifying the authenticity of this relic can be downloaded below as a PDF file. Saint Philip (1515-1595) is known as the Apostle of Rome, and founded the Congregation of the Oratory. Saint Julia was a virgin martyr. The Holy Innocents were the children killed by Herod in his attempt to kill the newborn King of the Jews. Anthony of Padua (1195-1231) was a priest in the Franciscan order who preached very passionately and is now the patron saint of finding lost things.